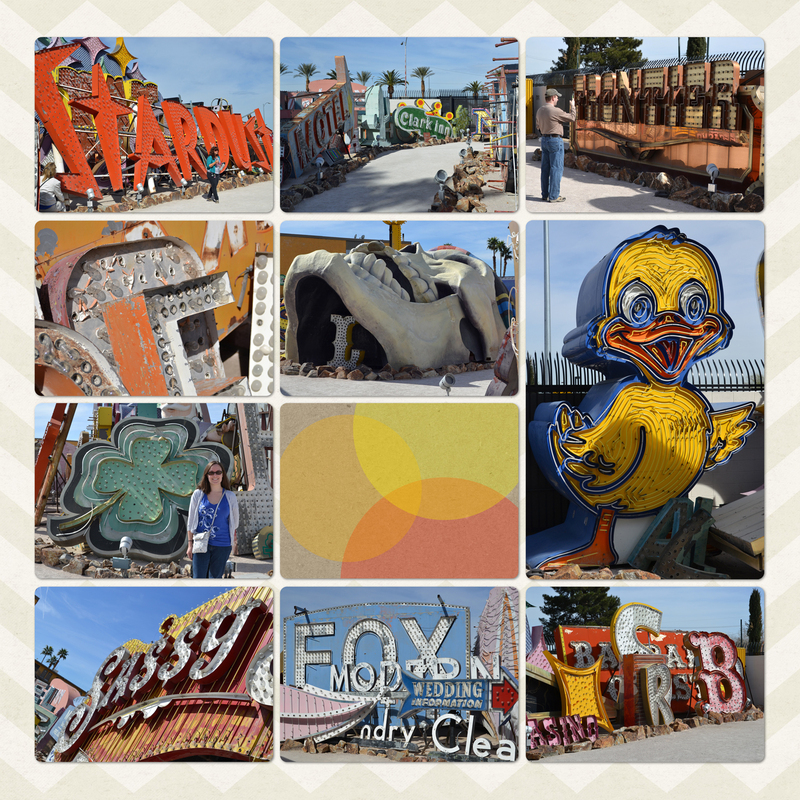 I finally had some time this weekend to finish scrapping our trip to Las Vegas. I'd started it several weeks ago but a million things seemed to get in the way of finishing. One thing I enjoy about not doing a strict weekly or monthly format this year is that it doesn't matter how many pages I use for a specific period of time. 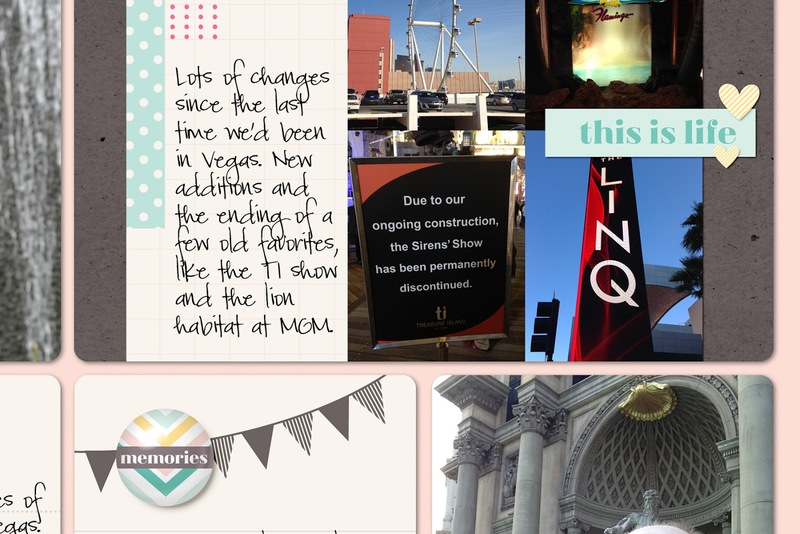 Our 5 day Las Vegas trip took 6 pages. Here's a look at all 3 layouts in full. 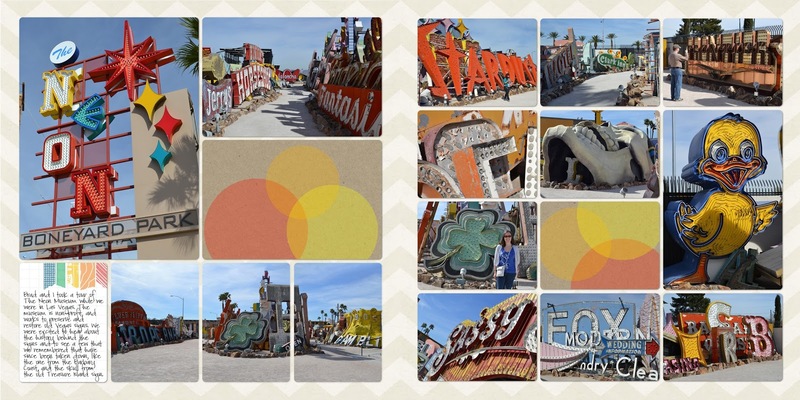 The first two are the trip as a whole, and the last spread is just the tour of The Neon Museum. 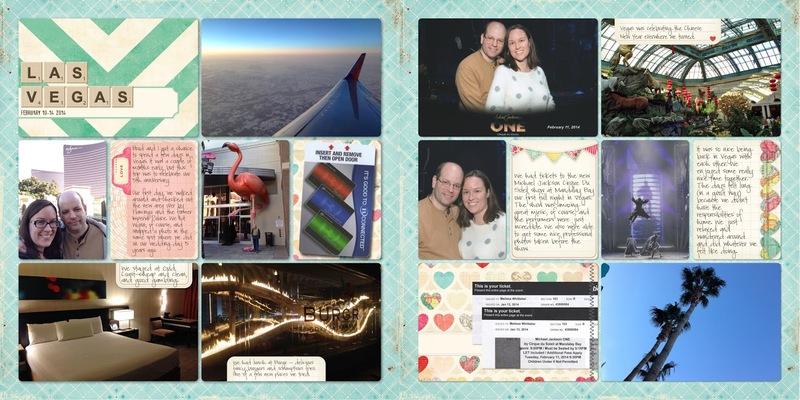 I used a variety of kits (Project Life and digital scrapbooking) for these pages. 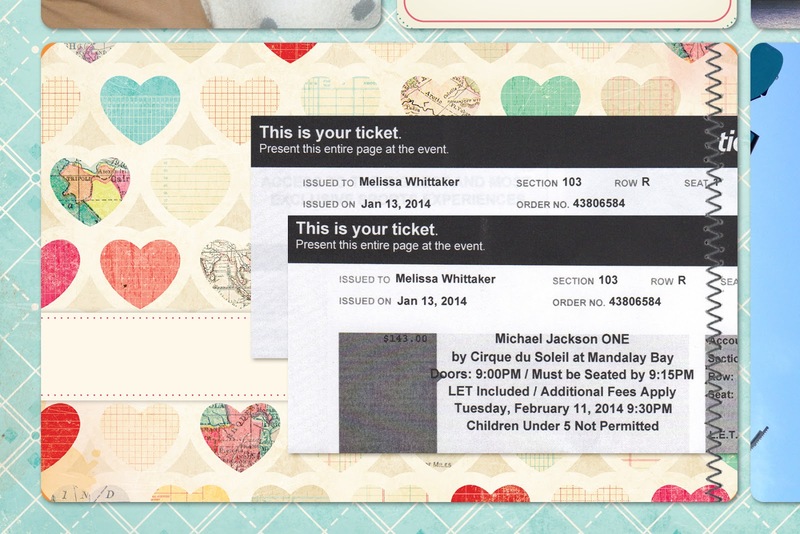 Starting with the top layout, I used a digital paper from Crate Paper's Fourteen paper pack. The cards were from the Project Life Love theme pack, which coordinates with Fourteen. This page was our arrival and the first morning in Vegas. I included a photo from the plane, and one of our hotel room, along with our room key. 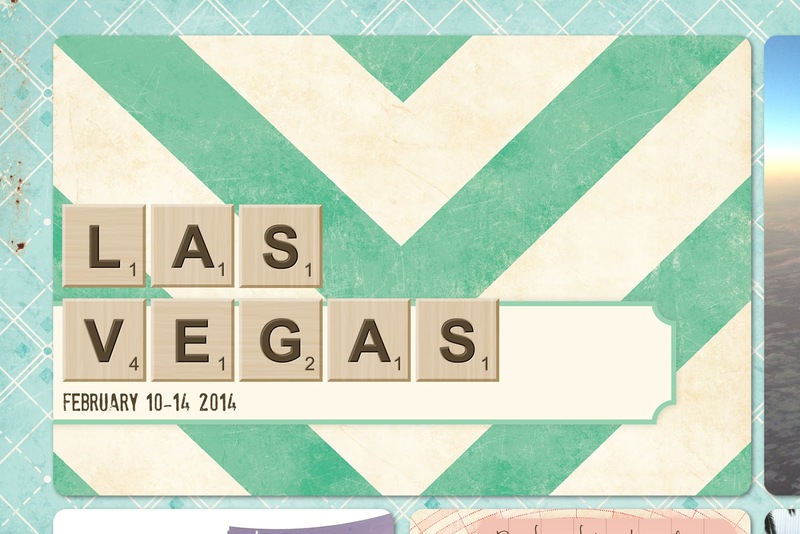 I used one of the Project Life Love title cards and some thickers from Traci Reed to make a title. (The alpha is free, but you need to go here to sign up for her newsletter to access the download). 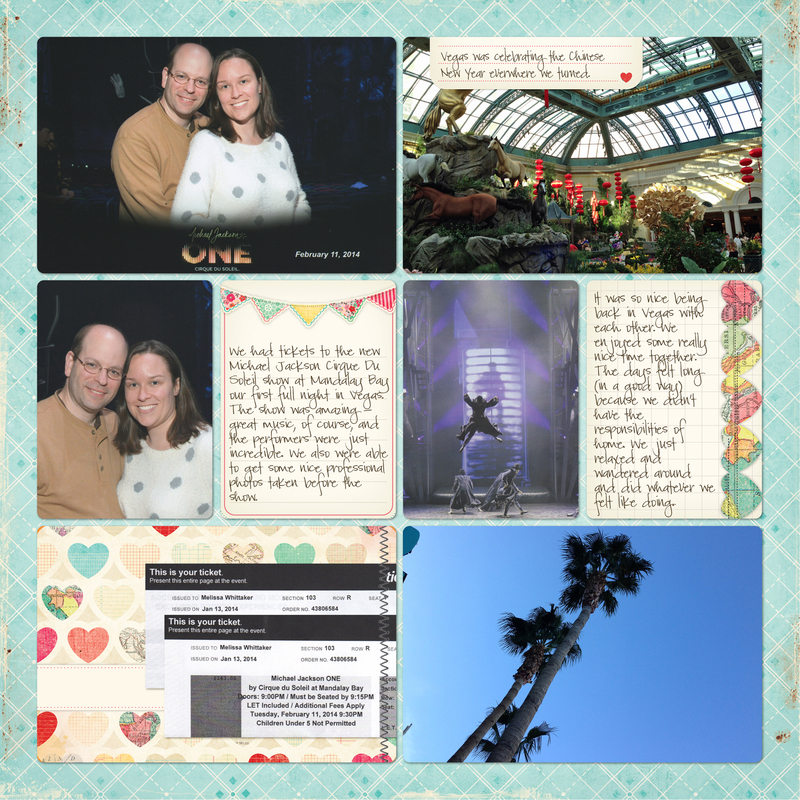 On this page I added photos that were taken while we were at the Michael Jackson Cirque Du Soleil show, along with our ticket stubs. I just layered these on top of a title card from the Project Life Love pack and added some stitches from creashens. For the next spread, I used a paper and embellishments from the 5th & Frolic digital kit, along with cards from the Project Life Polka Dot Party mini kit. 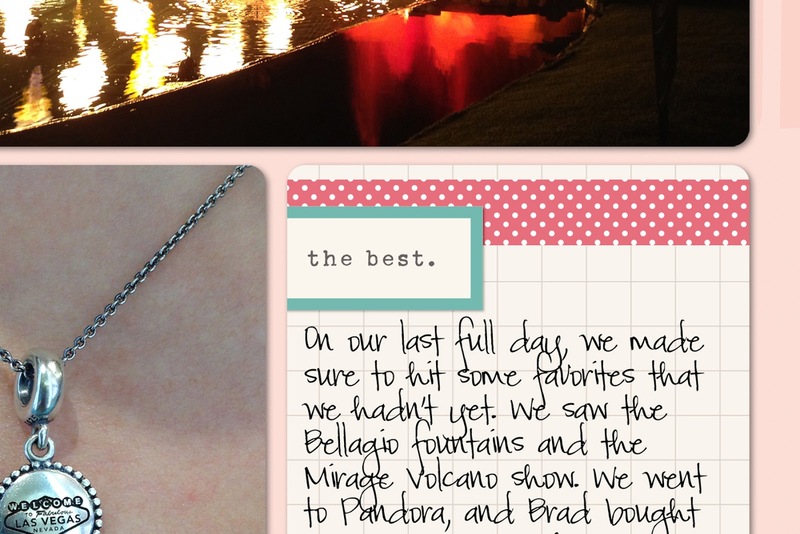 I had a few selfies of Brad and I that I snapped while on the trip, and I thought it would be nice to put them on the same page and write a little note about them. I also noted the changes that we noticed between our last trip and this one. I added some of the 5th & Frolic elements in a few places, and I even used a flair layer style from Mommyish to combine two elements into a custom flair button. 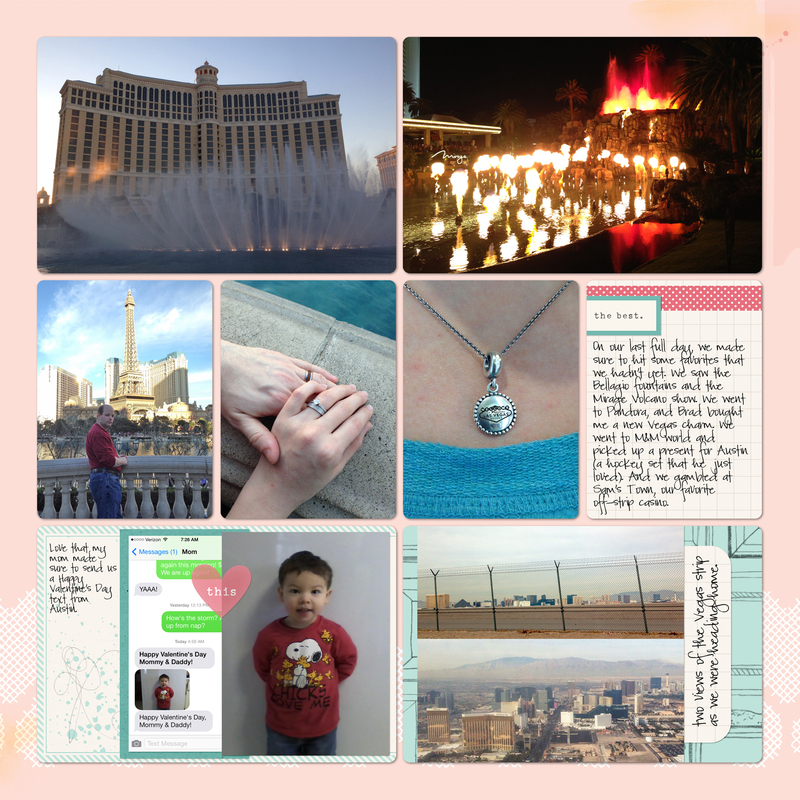 On this page I had photos from our last full day in Vegas, a photo that my mom texted to me on Valentine's Day, and a couple of photos of the Las Vegas strip - one from our rental car on the way to the airport, and another from the air. I used more elements from 5th & Frolic, and on one card from the Polka Dot Party kit, I copied the "the best" element and added it on top of a border strip, to make it appear more like a sticker/label than just part of the journaling card. Love how that turned out. 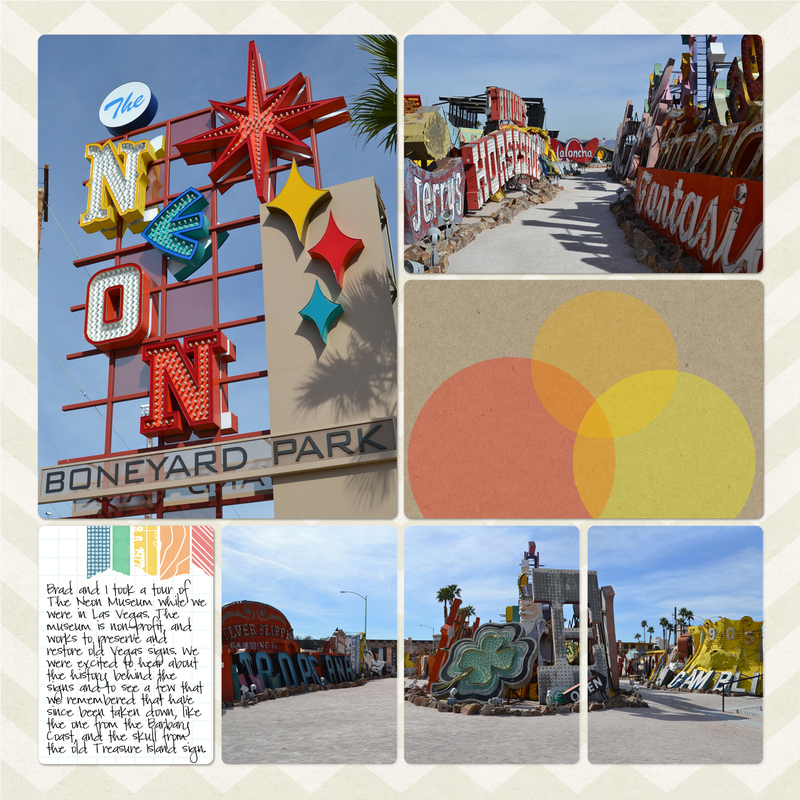 The last spread is our tour of The Neon Museum. I had so many photos from that tour that I wanted to separate it from the rest of the trip. 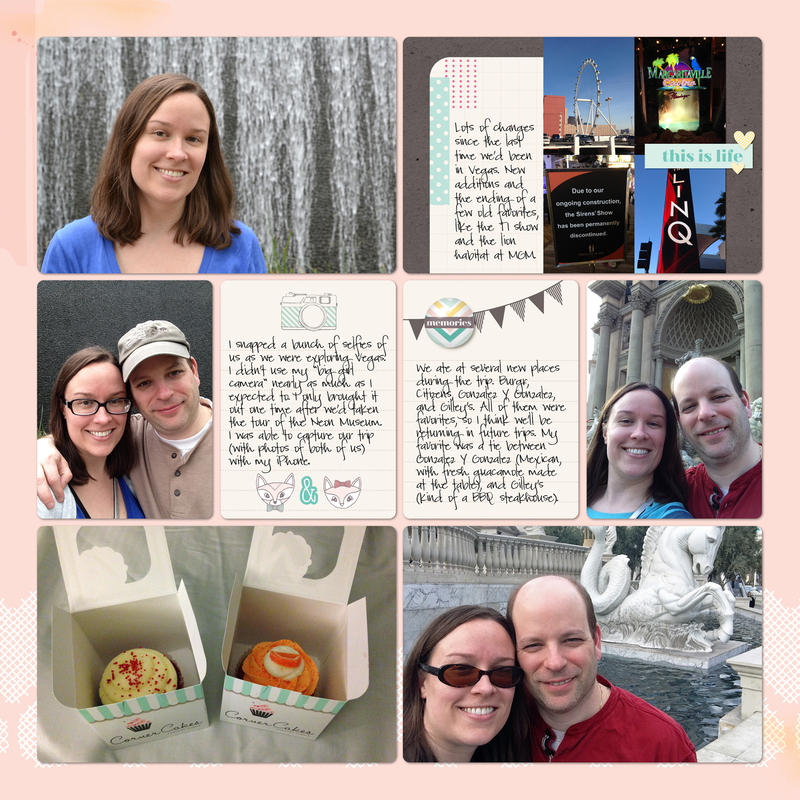 I used a free paper from Shannon McNab, which was part of her For The Love Of mini kit from February's Digiscrap Parade. On this page I added the panoramic photo I'd made in Photoshop Elements (super easy with the Photomerge feature), across 3 pockets. I just merged the 3 pockets together as one layer before applying the clipping mask to the photo. I used a couple of cards from the free sampler from The Lilypad. I repeated the one with the circles on the second page of the spread. I didn't have a lot to write about the tour so I used my pockets for the photos. My templates are all from Cathy Zielske, by the way. Occasionally I do adjust the templates to suit my needs - such as on this last page, where I removed the two right hand 3x4 slots and added in a 4x6. 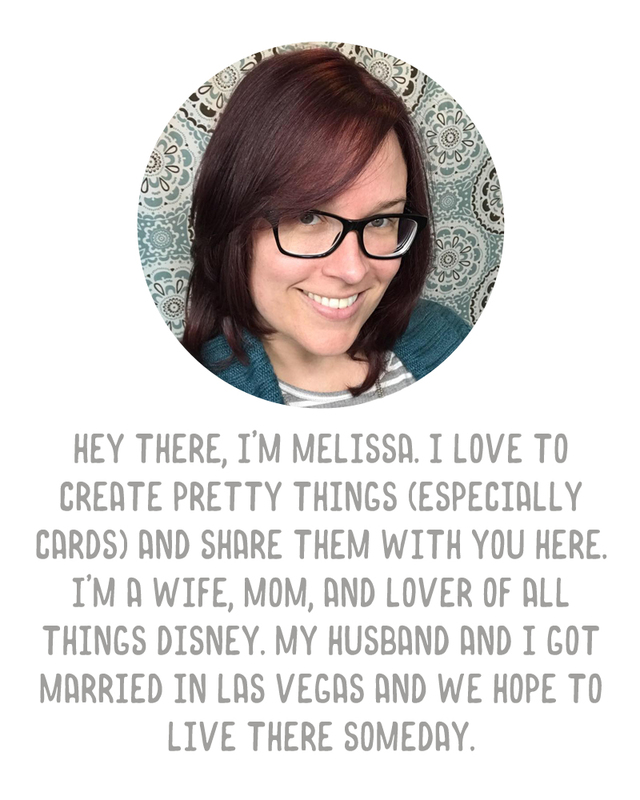 I just took a 4x6 layer from one of her other templates and copied it into this template, then deleted the two layers I didn't need. 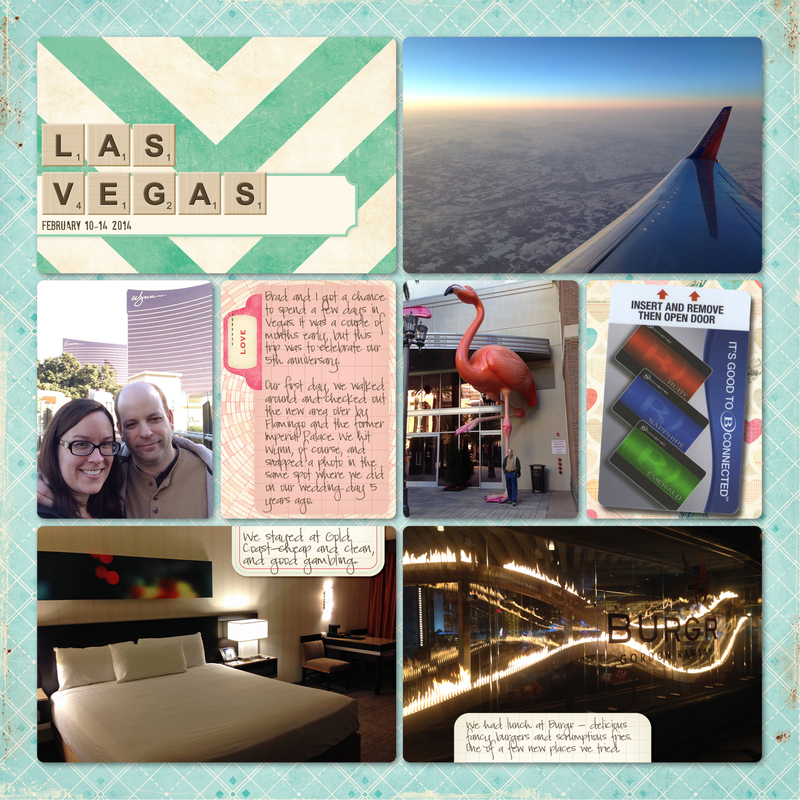 So there you have it, my Vegas trip is documented. 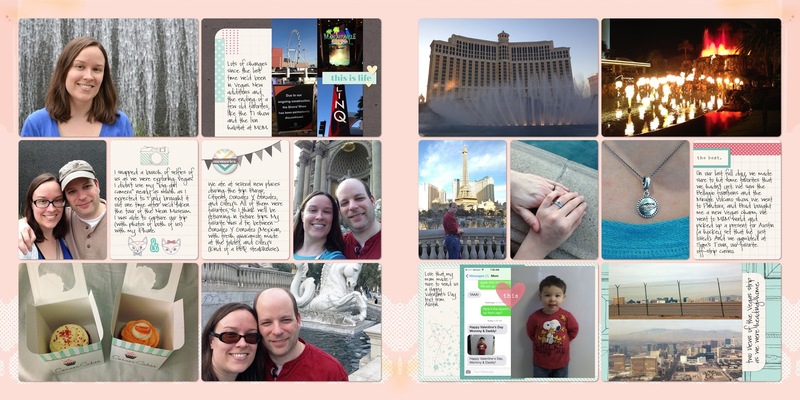 I'm actually planning to make a couple of traditional scrapbook layouts (physical, not digital) with some of my favorite photos from the trip, so hopefully I will have those to share with you soon.